Follow along on the restoration adventures of a 1947 Dodge that has been in our family since 1949. I mentioned that we spent some time down at the Farm last Saturday. It was a fun-filled day that conjured up many past memories of hanging out at the farm when we were kids. We’d go down to the farm many weekends when we were little and spent hours walking around in the pasture chasing Grandpa’s goats and looking at all of his old cars. There were a lot of them! Grandpa would park his old cars out in the pasture when he was done using them. The only vehicle from the past that is still parked out there today now belongs to my big brother, Don. That vehicle is also a Dodge, a 1946 WD 21, one ton flatbed truck. On Saturday, when we were standing out by the Dodge truck, taking a break from shoveling some gravel, Mom told Joel and me that the truck’s name is Wanda. I didn’t know the old Dodge truck had a name! Mom went on to say that the people Grandpa Anderson bought it from named her Wanda so she came to them already named. At one point WANDA was painted above the windscreen. You can’t really see the lettering now but you can see COLE CAMP MO. painted on the door and above that, if you look very closely, you can see the faint remainder of ANDERSON FARMS. Mom said she hand lettered ANDERSON FARMS on the truck’s door. I’m not sure how old she was when she did that but I believe Mom started 4th grade in Cole Camp and went to school there through 7th grade so she was pretty young. We’ve talked quite a bit about what to name the 1947 Dodge but haven’t come up with a proper name quite yet. 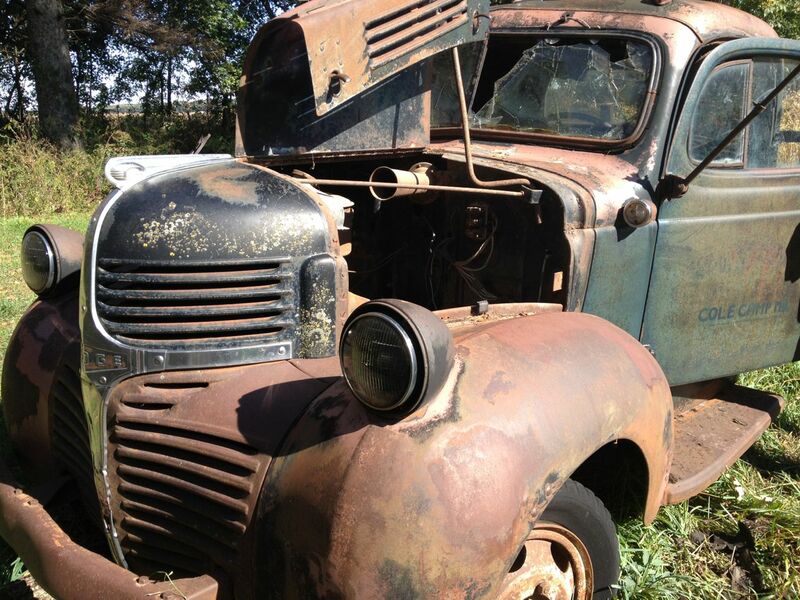 But the 1946 Dodge that belongs to Don has a name – Wanda. It seems to fit her well. Wanda has been sitting in the pasture for as long as I can remember. Thirty years? Forty? I can’t recall just when Grandpa retired and moved from his big farm to his little 12 acres on the edge of town but it was a long time ago. Don has dreams of restoring Wanda someday. It’s in pretty tough shape in many ways but, miraculously, Don and Joel checked the engine and it’s not stuck. Amazing! Okay, it doesn’t run and there’s no upholstery on the seat and the cab is full of stuff – but other parts of the Dodge truck have held up well. So, just because it’s fun to look at old vehicles, and because Wanda is a part of our family as much as our yet-to-be-named 1947 Dodge, here’s a photo gallery of pictures of Wanda for you to enjoy. Joel took all of the pictures. Click on any image to view full-size or to view as slide show. If you are viewing this in your email, click on the title to see the gallery on the website. Don and my Mom, Charlotte, check out Wanda. Inside the cab. Lots of stuff. No rats, though! This taillight is in perfect conditionn! Another shot of the inside. You can faintly see ANDERSON on the door. COLE CAMP MO. shows up well. Another view of the flatbed. Kinda artistic-like. Today was another Thursday Dodge Work Day for me. I only had a couple of hours free but headed over to Joel’s early in the afternoon to see if there was anything I could do to help with the Dodge. After seeing lots of progress in the first couple of weeks now it seems like things are moving pretty slowly. Joel reported that he’s been feeling kinda frustrated at times with what feels like a lack of forward movement with the project. I, too, looked at the Dodge and wondered “uh, what were we thinking?” because the project just seems so big. I mean, there are holes in the floor! The Dodge only sort of runs. The interior needs to be redone. On a good note, however, the carpet Joel put in the Dodge covers most of the holes. The Dodge sort of runs when it didn’t run at all a month ago! And at least there aren’t any dead rats in the headliner any more! So on Thursday we weren’t exactly sure what we were going to work on but we went out to the garage to take a look and see what we should do. I noted the oil stains on the garage floor. 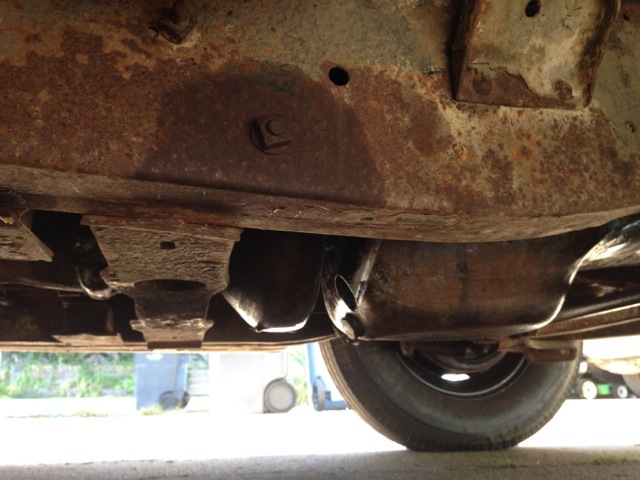 Joel had a hunch as to where the oil was coming from but I decided to get under the car and take a look and see for myself so scootched myself under the huge Dodge and found oil drips on the bottom of the oil pan. Joel knew where the oil was, really (the oil pan back by the transmission or possibly a rear seal), but I thought it would be fun to look anyway. I mean, I was dressed to work, I might as well get dirty! It was kind of fun to look at the Dodge from underneath it. 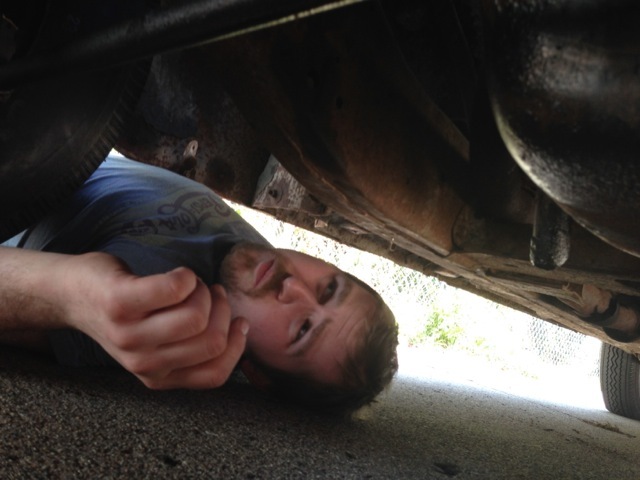 Joel crawled under the Dodge, too, and we both had a look around at the oil drips. 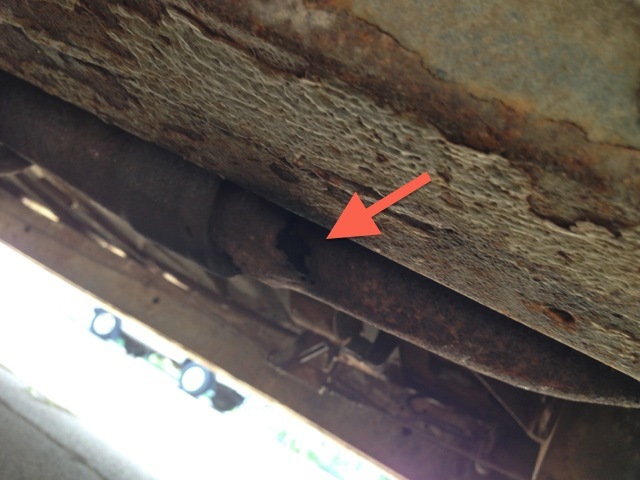 Then we took a good look at the exhaust system. It has a couple of pretty big holes in it so that it currently vents exhaust up through the holy (as in full of holes, not saintly) floorboards so that anyone riding along in the Dodge gets a good dose of exhaust fumes during their ride. We took a look at the fan belt, which is badly frayed, and at a few other things. You can barely see the fan belt near the top of the picture. It is in pretty rough condition but it still works okay. 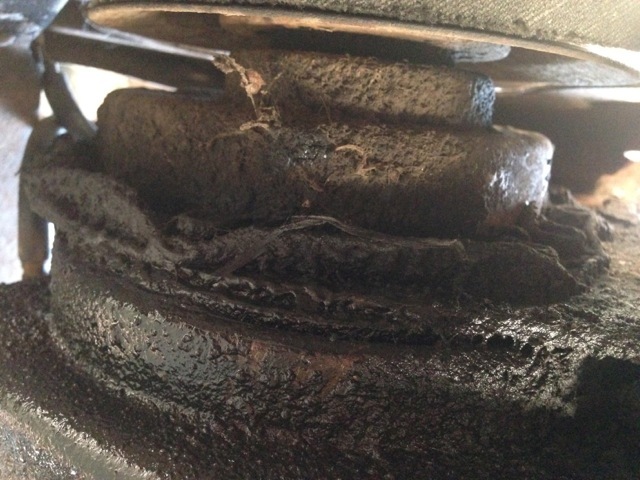 I’d say there’s a good amount of grease and grime covering the underside, don’t you think? I am still pretty daft at knowing what all makes up the Dodge’s flathead straight six engine (flathead, that’s the top of the engine. It’s flat. The top of it is called the head. Six means six cylinders. Straight means the cylinders are all in a row, as in a straight line) but I CAN find where the oil is coming from, am not afraid of getting dirty and am decent at helping assess what is going on with the Dodge when we have her running. So, while I’m not a true “car guy/gal,” I sure am learning a lot about our old car in no small part because Joel takes time to answer my questions. So while the two of us were looking at the Dodge’s underside and then listing to her run and looking under the hood, I’d ask Joel questions. “That’s the fuel pump,” Joel would say. And I’d respond , “Oh, yep, that’s the thing that Harold (our friend who rebuilds car engines) said gets clogged on these old cars that haven’t run for a long time.” And Joel and I would talk about how we might replace the old fuel filter with a modern fuel filter. Then I’d point out something else and Joel, patiently and without making me feel the least bit silly for asking, would answer my questions. And we’d talk more about car parts and what they do. And I’d learn things. Things about our old car. Things about Joel and how much he’s learned about our old car in a handful of weeks. I think it’s safe to say I’ve even learned a thing or two about myself. It’s kind of interesting to note – I grew up with a Dad who knows everything about cars and an older brother, Don, who is a mechanic. I had two great teachers who would have taken time to show me just about anything about cars when I was younger. But I guess I wasn’t ready to learn about cars then. Dad doesn’t work on cars very much these days. He’s slowing down a bit. Don is probably quite willing to teach me things if I take the time to ask. But, because we had the crazy idea to buy this old Dodge and fix her up, it’s my little brother who is teaching me about cars now. And for that I am very grateful. Thanks little brother! I think, though, the next time I see Dad (likely this Saturday) and my brother, Don, I’ll start asking them questions so I can learn even more. 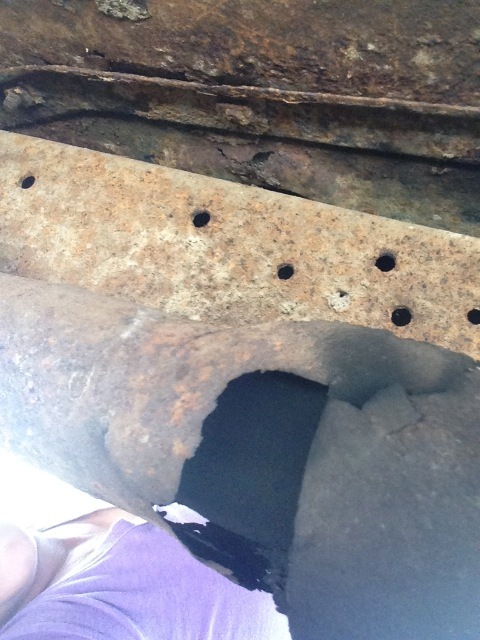 …exhaust hole number two. You don’t need a red arrow pointed at it to notice this hole! After looking at the Dodge for awhile, Joel, my nephew, Liam, and I headed to the auto parts store to get some stuff. We picked up an exhaust repair kit to fix the holes in the exhaust. We found some 6 volt dash light bulbs, tiny little things to make the Dodge’s clock light up in the dark. “Six volt?” the guy at the auto parts store asked. I believe he thought we were crazy for wanting a 6 volt light as cars run off of 12 volt systems these days. “Is this for a really old car?” We assured him that yes, the bulbs were for a really old car. He found two for us (and now the clock light works) and another salesperson found us a new fan belt (even though we brought in the old belt, we still didn’t get the right size. We’ll try again.) and we got another thing or two then headed back to Joel’s. Back at Joel’s, we unloaded our purchases. Liam, who had fallen asleep on the way to the store, slept on in his car seat. I swept out the garage while Joel started working on the Dodge. And soon it was time for me to head home. It was another good Dodge work day. I’m already looking forward to the next one. p.s. if any of my car talk above is incorrect, which is entirely possible, it’s not because my brothers or Dad told me the wrong information about flatheads or cylinders or volts or fuel pumps or anything else. It’s because I’m still learning. The dodge lives! And leaks. But just a little bit. The Dodge came to life today. After an adjustment of the points and a change of motor oil I finally achieved the proper amount of compression and spark and she(he) just woke right up. There was this one moment, when I got just the right amount of gas and starter fluid into the carb, it suddenly just took off. And for the first time since it’s been in my garage, a giant stream of gas flew out of the fuel pump. And a big healthy backfire and there I was. I reattached the fuel filter line to the carb and repeated what I just did, turned my camera on and just turned it over. Not even a sweat this time, the car just started right back up. Now comes the careful balanced juggling of throttle and choke to keep her alive. I danced with the knobs and pedal for a few moments and let go the accelerator. Idle. Now at this point I still don’t have water running through the old engine block, so I shut her off. I let it rest for a little bit while I immediately sent videos to Myrna and a couple friends. I was beyond excited. But oh no, I have to get ready for work. So I let it relax a little bit longer and decided to turn it over one last time. It didn’t even hesitate to start at this point and it was once again pouring white smoke into the garage, and making that oh so glorious kachug kachug kachug sound. I work late, so by the time I got home I couldn’t turn her over again, that would cause a panic and a stir and at least annoy the crap out of the neighbors. So when I got home, I went about reattaching hoses and bits and pieces. I got everything back where it belonged and started filling the radiator up. Woops, a leak, no its just a drain plug. Drain plug fixed, moving on. Ok, engine is getting closer to full, oh, now my thermostat housing is leaking, ok sort of fixed that. Moving on. Oh I see all the old hoses are leaking, better buy new rubber. Worry about that later. Oh…. shoot. 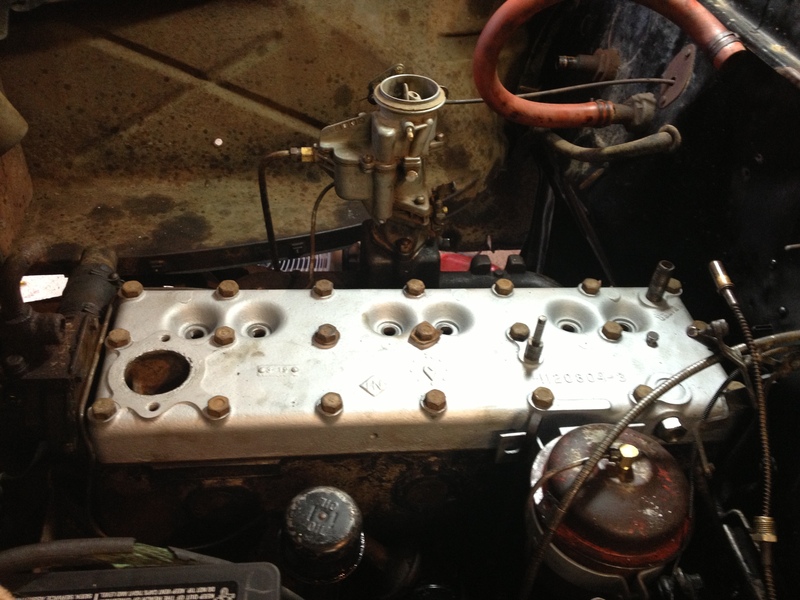 There is a leak on the outside of the head gasket by the 4th and the 5th Cylinder. Double shoot. Nobody ever told me working on this car would be easy, or cheap. And that’s just the way it’s going to be. I opened up a few plugs to double check that there was no moisture in the cylinders and was in luck. So it would appear my leak is just to the outside of the engine. Relief. Anyways, I figure I’ll refill her with water tomorrow, show the parents my progress and then proceed to start ripping the engine apart again, this time replacing every gasket in my way. I also have a carb rebuild in my future and I’m going to take a crack at repairing the brake master cylinder. I created an unrealistic but still not impossible goal earlier today to get it ‘road worthy’ in two more weeks time. So lets see how I do. A stich in time saves nine, so why do I only have three? After an eventful and exciting evening on Saturday, I knew I had to get back into the garage tonight. The impossible turned very possible and I was sure I could build a sand castle with strawberries. So, the engine is free, moving like a champ, what is the next obvious course of action? Put it back together and start it up, duh! That was the plan at least. As I went to bed Saturday night and reflected upon my day’s worth all sunday – I knew I had a plan. A simple plan. 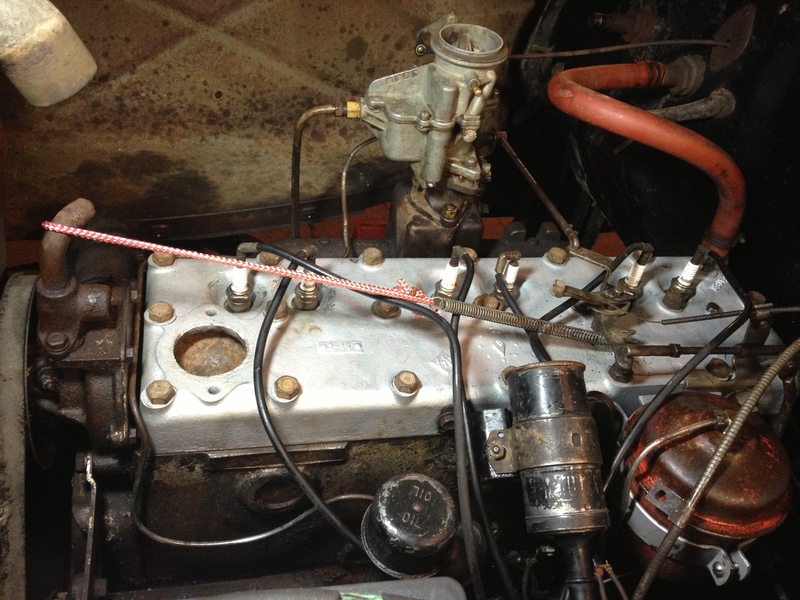 Reattach the carb, the head, all bolts related to the manifold, insert gas or other flammable material and start automobile. Seems do-able. And it started pretty well too. I got under the car, and bolted away, putting this one here, don’t need that one anyways, throw that there, don’t put that back on because it’ll get in the way, etc. 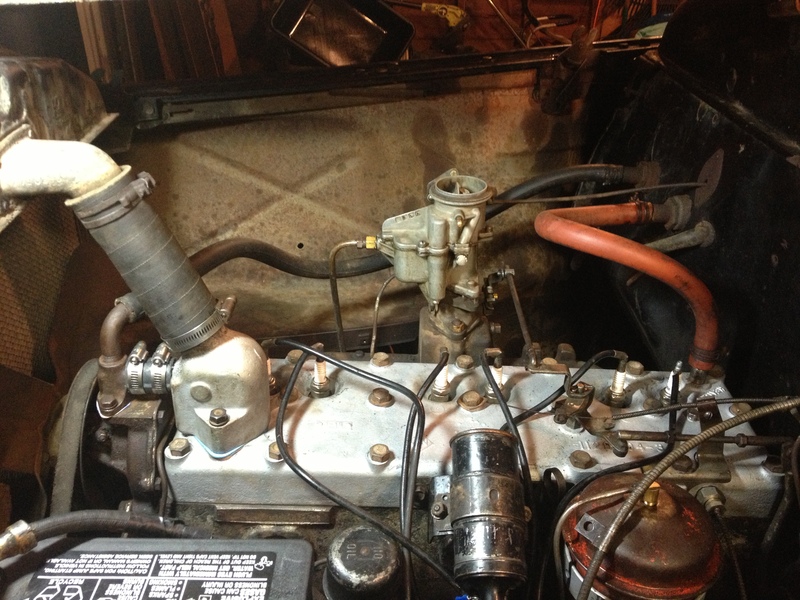 I positioned the head gasket, and eased the head back onto the engine. Found the trusty torque wrench my brother Donald loaned me and started to work, following a repair manual nearly as old as the car itself(also a loaner from Donald, thanks Bro!) And had things looking pretty respectable. Now comes that pesky electrical system. I have to once again get the ignition coil in place, and attach all the various other accessories, and look everything over one more time. Looks good. I feel a need to remind everybody that this engine probably hasn’t been operational in 20 years but I only mention that because I often overlook that fact. Ok, so everything is in place, I already know the starter works great, I already know that I’m going to bypass the fuel tank for now. I’m going to hit this guy head on and dump gas down the carb and let her rip. The engine turns over with its furious 6 volts of DC power, the engine sounds like it knows what to do, it cranks. It cranks some more. I stop. I give it a little more gas and it cranks again. Nothing. This is where 99% of the people out there aren’t even kind of surprised. Of course it doesn’t start. This engine needs more love, more time, more TLC. Time to go into crude not really a car guy but kind of a car guy diagnostic mode. I add some fuel to a cylinder and try again, nothing. I check all the wires, Nothing. I rig up a plug outside the engine to test for spark. Nothing. Oh wait, no spark. That’s not nothing, that’s something. No spark suddenly puts everything into perspective. I now know that there may be one hundred things wrong right now, but the first thing I need to do is get spark. And this is where I’ll leave it for tonight. I did everything I know how to do with ignition systems(which is pretty lacking). I hope tomorrow to get some more time under the hood to further diagnose the problem. Maybe swap a few parts, maybe just let time heal some mechanical wounds.